They pose for Smitty's camera. Introduction: One of the lesser known pleasures of the cowboy was the occasional spur of the moment bath in the horse trough. On the range a cool relaxing dip in the Stock Tank filled with water from a local spring or windmill pump brought hours of relief and a much happier dispostion for the cattle weary wrangler. The latter cow poke experience was known to me in the deep, cattle grazed, canyons of Eastern Oregon. The memory stayed with me into my urban existence especially during the hot days of July and August in Portland, Oregon. 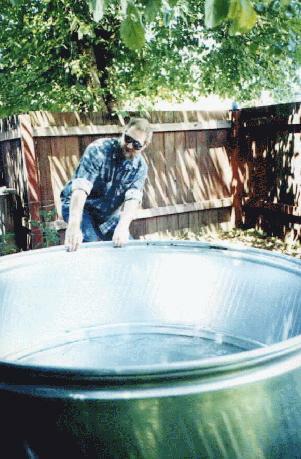 I would often wish for a tub of cool water to relax in after a hard day's work. One of my city jobs was to maintain a swimming pool owned by some folks who I had done some construction work. A benefit was the relaxation I felt after a cool respite in the pool which greatly improved my feeling of tiredness after the workday. After five years of being reminded of the virtue of a cool dip in a large pool of water, I decided to renew an old memory in my own backyard. 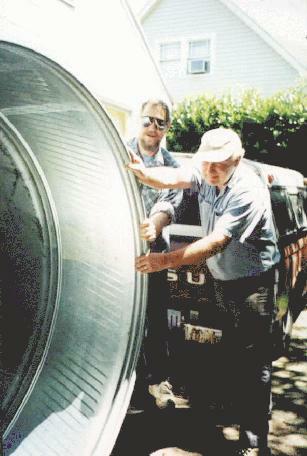 Keith & Eric roll the $137 stock tank off the back of truck. 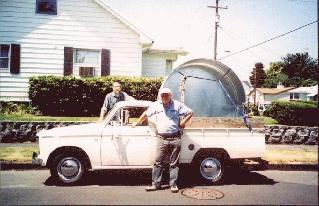 Keith pulls stock tank into prepared place. 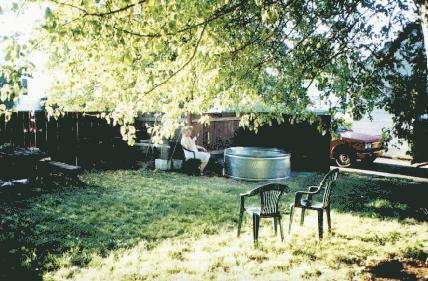 Smitty sits beside the stock tank, a dream realized at last, in the backyard apple tree park. Closer view. Smitty sits on side of tank wondering, "Ok. When are we going to add the water? I'm ready!" Closer view. 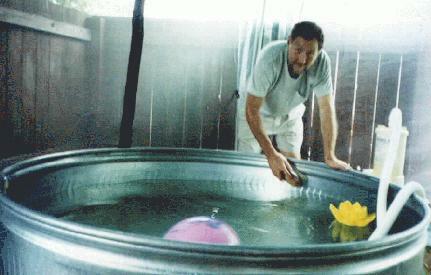 Keith washes down the side of the tank. Smitty doesn't know it yet, but the toys in the pool are gonna go! 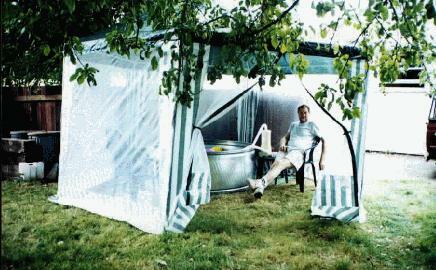 A screen house is added to the back yard bath. Keith relaxes in yard chair next to stock tank. The water filter pump can be seen on table to Keith's left. 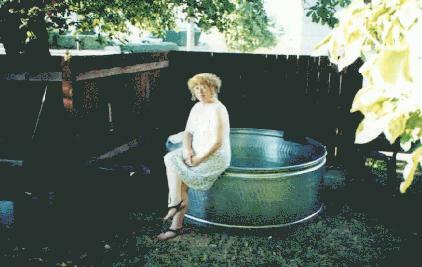 A cool dip on a hot day becomes a hot soak for a cool evening. This web page launched September 1, 1999. © 1999-2001, 2014- All rights reserved.